The search for natural gas begins with geologists (people who study the structure and processes of the earth). They locate the types of rock that are known to contain gas and oil deposits. Today their tools include seismic surveys that are used to find the right places to drill wells. Seismic surveys use echoes from a vibration source at the earth’s surface (usually a vibrating pad under a truck built for this purpose) to collect information about the rocks beneath. Sometimes it is necessary to use small amounts of dynamite to provide the vibration that is needed. Because natural gas is colorless, odorless and tasteless, mercaptan (a chemical that has a sulfur like odor) is added before distribution, to give it a distinct unpleasant odor (smells like rotten eggs). This serves as a safety device by allowing it to be detected in the atmosphere, in cases where leaks occur. Most of the natural gas consumed in the United States is produced in the United States. Some is imported from Canada and shipped to the United States in pipelines. Increasingly natural gas is also being shipped to the United States as liquefied natural gas(LNG). We can also use machines called "digesters" that turn today's organic material (plants, animal wastes, etc.) into natural gas. This replaces waiting for thousands of years for the gas to form naturally. How Is Natural Gas Stored and Delivered? The gas companies collect it in huge storage tanks, or underground, in old gas wells. The gas remains there until it is added back into the pipeline when people begin to use more gas, such as in the winter to heat homes. Natural gas is moved by pipelines from the producing fields to consumers. Since natural gas demand is greater in the winter, gas is stored along the way in large underground storage systems, such as old oil and gas wells or caverns formed in old salt beds. The gas remains there until it is added back into the pipeline when people begin to use more gas, such as in the winter to heat homes. When chilled to very cold temperatures, approximately -260 degrees Fahrenheit, natural gas changes into a liquid and can be stored in this form. Because it takes up only 1/600th of the space that it would in its gaseous state, Liquefied natural gas (LNG) can be loaded onto tankers (large ships with several domed tanks) and moved across the ocean to deliver gas to other countries. When this LNG is received in the United States, it can be shipped by truck to be held in large chilled tanks close to users or turned back into gas to add to pipelines. When the gas gets to the communities where it will be used(usually through large pipelines), the gas is measured as it flows into smaller pipelines called "mains". Very small lines, called "services", connect to the mains and go directly to homes or buildings where it will be used. We measure and sell natural gas in cubic feet (volume) or in British Thermal Units (heat content). Heat from all energy sources can be measured and converted back and forth between British thermal units (Btu) and metric units. See the Energy Calculator for help with converting natural gas units. One Btu is the heat required to raise the temperature of one pound of water one degree Fahrenheit. Ten burning kitchen matches release 10 Btu. A candy bar has about 1000 Btu. One cubic foot of natural gas has about 1031 Btu. A box 10 feet deep, 10 feet long, and 10 feet wide would hold one thousand cubic feet of natural gas. 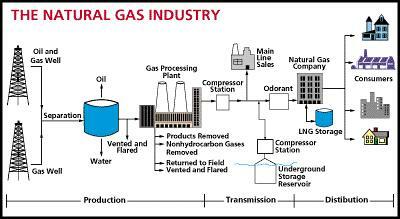 How Is Natural Gas Used ? Approximately 22 percent of the energy consumption of the U.S. comes from natural gas. Slightly more than half of the homes in the U.S. use natural gas as their main heating fuel. Natural gas is also an essential raw material for many common products, such as: paints , fertilizer, plastics, antifreeze, dyes, photographic film, medicines, and explosives. We also get propane when we process natural gas. Propane is the fuel many of us use in our barbecue grills. Natural gas has thousands of uses and industry depends on it. It's used to produce steel, glass, paper, clothing, brick, electricity and much more! Homes use it too. More than 62.5 percent of homes use natural gas to fuel stoves, furnaces, water heaters, clothes dryers and other household appliances. It is also used to roast coffee, smoke meats, bake bread and much more. How Does Natural Gas Impact the Environment? Natural gas burns more cleanly than other fossil fuels. It has fewer emissions of sulfur, carbon, and nitrogen than coal or oil, and when it is burned, it leaves almost no ash particles. Being a clean fuel is one reason that the use of natural gas, especially for electricity generation, has grown so much and is expected to grow even more in the future. Of course, there are environmental concerns with the use of any fuel. As with other fossil fuels, burning natural gas produces carbon dioxide which is a very important greenhouse gas. Many scientists believe that increasing levels of carbon dioxide and other greenhouse gases in the earth’s atmosphere are changing the global climate. Also, as with other fuels, natural gas also affects the environment when it is produced, stored and transported. Because natural gas is made up mostly of methane (another greenhouse gas), small amounts of methane can sometimes leak into the atmosphere from wells, storage tanks and pipelines. The natural gas industry is working to prevent any methane from escaping. Exploring and drilling for natural gas will always have some impact on land and marine habitats. But new technologies have greatly reduced the number and size of areas disturbed by drilling, sometimes called "footprints." Satellites, global positioning systems, remote sensing devices, and 3-D and 4-D seismic technologies, make it possible to discover natural gas reserves while drilling fewer wells. Plus, the use of horizontal and directional drilling make it possible for a single well to produce gas from much bigger areas than in the past. Natural gas pipelines and storage facilities have a very good safety record. This is very important because when natural gas leaks it can cause explosions. Since raw natural gas has no odor, natural gas companies add a smelly substance to it so that people will know if there is a leak. If you have a natural gas stove, you may have smelled this “rotten egg” smell of natural gas when the pilot light has gone out. b) 25% of the homes in the U.S. use natural gas as their main heating fuel. 5. Why does gas from your stove have a smell if natural gas is colorless, odorless and tasteless? d) mercaptan (a chemical that has a sulfur like odor) is added before distribution, to give it a distinct unpleasant odor (smells like rotten eggs).